Let's have a great and unforgettable party in this very central and very cool club – SWEET – home for those looking for unforgettable nights and magical moments. 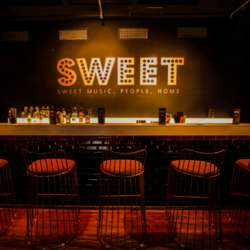 With over 1000 square meters, SWEET is the biggest club in Munich. A very stylish atmosphere and welcome drink for the first 100 guests await you. Please come early if you want to network and meet new people because at 22:30 the DJ will turn up the volume. Get ready to dance to RnB, hip hop, house, and chart hits mixed by the best DJs in Munich accompanied by original video shows. Please make sure to sign up to enter for free (Albatross Members) or at a reduced entrance fee (Basic Members)! Please do not hesitate to invite your international friends and other global minds. As always: Nobody stands alone! After 23:00 the club will open to the public. That means that you will have to pay the regular entrance fee. The guest list will be closed around 16:00 on the day of the event. We are looking forward to partying with you! Come for the "SWEET music, people, home".